There was good news for the Bee Cause campaign this week. A powerful group of MPs is to investigate the impact of pesticides on bees. The move follows mounting evidence about the harmful effect of neonicotinoids, including a recent report by Friends of the Earth. The Environmental Audit Committee will quiz Ministers about why the UK has failed to join other European countries, such as France and Italy, in suspending use of neonicotinoid pesticides. The influential committee will also look at the effect of pesticides on human health and address broader issues, such as whether the Government should encourage alternatives to pesticides. You can support the Bee Cause campaign by signing an online petition, which calls on David Cameron to introduce a National Bee Action Plan, including the suspension of neonicotinoid pesticides. This great blog from the Brentford Recycling Action Group gives more information about the Bee Cause campaign. Why is Friends of the Earth campaigning on bees? 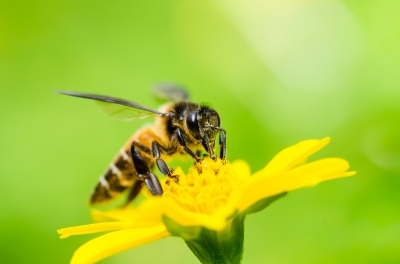 Many factors are causing bees’ decline – from habitat loss, to disease, to climate change. There is also growing evidence that some pesticides harm bees. Under threat: bees play a vital part in our lives. Curiosity got the better of me and I couldn’t resist taking a closer look and, sure enough, behind a gate there stood two big hives with hundreds of bees working busily away inside. 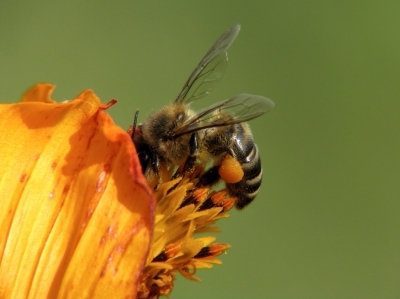 The UK is home to over 250 species of bee, including honey bees, bumble bees and solitary bees. They are important to our food supply and our economy, but they are declining at a worrying rate and action is needed to help them. Three bee species have become extinct and managed honey bee colonies, like the one I saw, fell by 53% between 1985 and 2005. A new report by Friends of the Earth calls for action in several areas across Government, including looking at the way we farm our land and the way we plan our towns and cities. The charity is calling on David Cameron to urgently draw up a National Bee Action Plan to reverse bee decline. 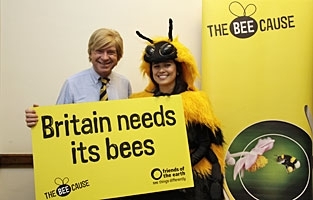 It says the Prime Minister needs to work across Whitehall and with local and devolved governments – and with farmers, businesses and government agencies – to ensure that effective action for bees is put in place across the UK. The charity has launched an online petition and is organising a series of Bee Cause events around the UK. These include two bee walks organised by the local Hounslow and Brentford group on 2 and 8 September at Boston Manor Park, and a Bee Friendly planting in Highbury Park on 22 September.